I can’t believe it’s Thursday already! I have so much to say about this past weekend, but I’m not quite ready to write a full race recap. I haven’t blogged in awhile because I didn’t want to screw with my juju… I felt really good when I started running (although I did have some phantom pains the first week, which I’ve had experience with before). Last week I wasn’t able to run much because Emmaline was sick and I couldn’t take her to the gym, but after that 8 mile run I knew I was going to be able to finish the marathon. I’m surprised I was able to run the whole way, but I’m sure the one million spectators had something to do with that. What an unbelievable experience. 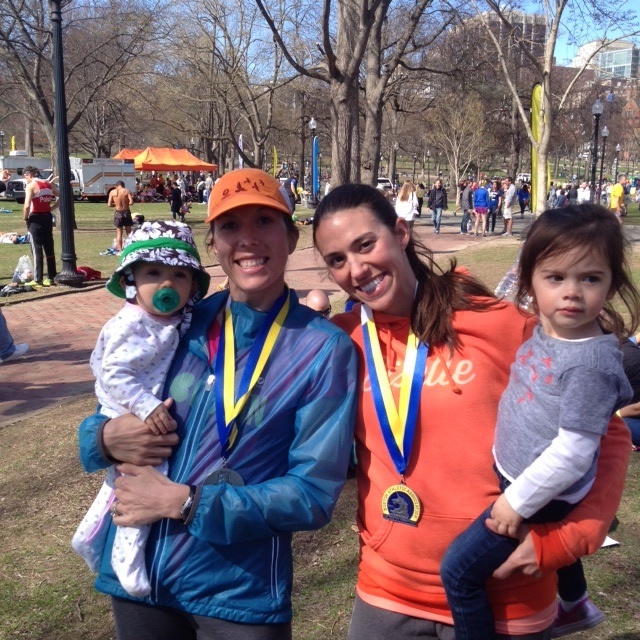 I’m so grateful I was able to run the 2014 Boston Marathon. Also, I have to say, I kind of loved that course. I might have a different opinion if I ever race Boston vs. run Boston… but I’ve always been a decent downhill runner. So many more stories to come! You are truly amazing. I know that you will be in Fall marathon shape and have an incredible PR. I am in shock that you were able to run and finish this so strongly. Well not really in shock, just more amazed. I’m happy for you. Thanks Hollie! I am very excited for my fall marathon (although I can’t get too excited yet or I will wind up injured again). Can’t wait for Boilermaker! Are you staying at relatives house for Boilermaker? I need to figure out what I’m doing for that as far as hotels go. I’m not sure… We may just drive up really early in the morning and leave the kids with my parents. The only other time I did Boilermaker was 2003 and we drove up that morning. It actually wasn’t that far and worked pretty well. I want to let you know that I nominated you for the Liebster Award. You can check it out on my most recent blog post. I hope you have as much fun with it as I did!! If you don’t have time no worries! Rock and run on. Nice! I will check it out. Can’t wait for next year!! !